The Daresbury Farmers’ Club was established in 1842 and held its first show at Daresbury, with a dinner afterwards at the Ring O’Bells. Gilbert Greenall was the president and Nathaniel Dennis Milner the vice-president. The club was established for “agricultural improvement and the encouragement of industry”. Records from the Chester Chronicle and Cheshire Observer give details of the show which was held annually until 1865, when an outbreak of cattle plague forced the show to close and the society to be disbanded. It was resurrected in 1869 under the name ‘Frodsham Central Farmers’ Club’. At the moment we know almost nothing about this, but the newspapers of the time will no doubt have accounts of the show. In 1895, the Hatton Amateur Horticultural Society was formed and its first show was held on Thursday August 17 in the grounds of Hatton Cottage, by the kind permission of Mr RL Wynne Jones. 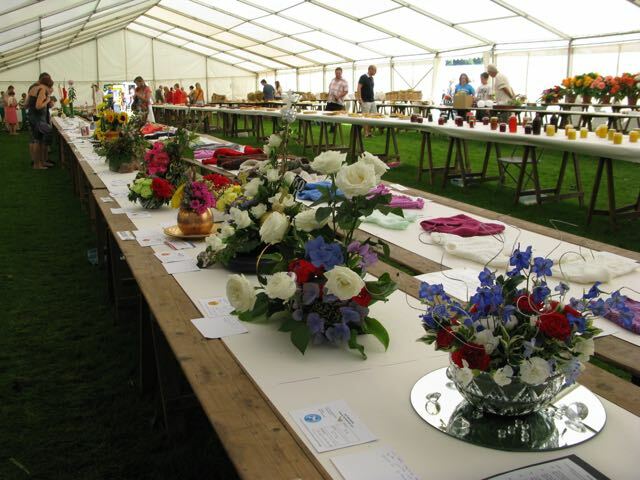 There were 144 entries and the exhibits, which were ‘of all round excellence’, were displayed in a large marquee. The weather wasn’t very good, but it didn’t deter the visitors and it seems that everyone had a good time. Walton Brass Band played throughout the proceedings. In the speeches afterwards, both Mr & Mrs Wynne Jones remarked that recently Hatton had become a model village and was as pretty a one as could be seen in Cheshire. The earliest schedule that we have for Hatton Show is 1931. The show was held on Saturday 22 August at Hatton Hall. It was the 31st annual show of the Hatton Horticultural Society, which was formed in 1895 – there were no shows during WW1. The catalogue itself lists all the entries in each class, gives us the names of the judges and details of any special prizes that were awarded. The first category was for ‘Garden Prizes’. We have nothing like it at our show today. Prizes were awarded for the neatest and best kept gardens in the villages and also for the best decorated dinner table. The window plants and cut flower classes we would recognise today, but children were encouraged to make wild flower baskets, with special prizes awarded by General Makin. The vegetable and fruit classes were similar to today, but not so the farmers’ section. Turnips, mangolds and swedes were all judged along with potatoes and corn. The miscellaneous section included honey, eggs, butter and home-made bread and fruit cake. There were no other opportunities for home baking and none at all for craft items. There were sections for poultry and rabbits and the pigeon class was judged on the ’likeliest flier’. 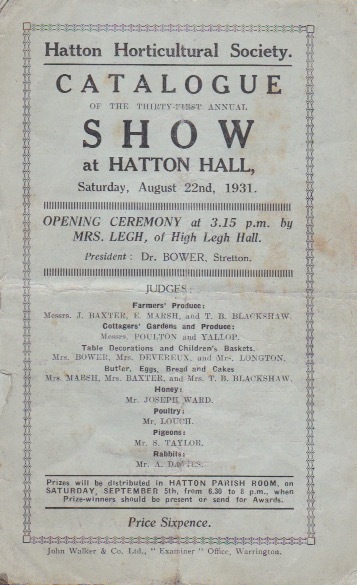 Discussions began in 1947 about the formation of a new society, and the following year ‘The Hatton and District Show Society’ held its first show in Daresbury. The society’s aim was to increase and stimulate interest in horticulture, agriculture and social functions and to hold an annual show at Daresbury. Shows have been held each year since then and records are available for us to follow its story – minute books, newspaper reports, personal recollections, photographs, prize cards.